The Bolivar peninsula is really a birder's paradise, especially winter migrants. There are lots of mudflats, protected areas and of course the shoreline and the bay. But, the best place for shorebirds has been at the North Jetty. It is a very popular fishing spot, but I was there last week and it was foggy and ... surreal. Only a couple of old guys fishing. The fog was the 'here-and-then-gone-patchy' kind of fog. But, birds don't care about the weather so much. They have to eat no matter what. Panorama of low tide at North Jetty with fog. Looking out on the mudflats, there were birds everywhere. These are Marbled Godwits, and I had only seen a few of these last September at Ft. Travis. Those were foraging in the grass for insects and never cooperated to give me a clear shot. Too busy, I guess. We sat down on the rocks to wait for them to come closer. Birding and photography is a lot about patience. While waiting for the godwits to move closer, several Willets showed up. Half the time when you see a shorebird of any size, it is a Willet. They do have nice coloring on the underside of their wings, but just poking around like this, they are rather bland. They eat insects, marine worms and crustaceans. It is a bit tricky, but there is an Eastern and Western subspecies of Willets, and both occur on the upper Texas coast. I will have to study this article more to know the difference. But already I am leaning toward a Western Willet. You know I am shooting manual now. This was a real challenge, as the fog would come in and then recede, then clouds would hide the sun and then not. This meant I was constantly changing ISO and shutter speed, or getting caught with inappropriate settings when something cool happened. Although not common tablefare today, they were once a popular British dish. Sir Thomas Browne writing in the seventeenth century noted that godwits "were accounted the daintiest dish in England." The name Godwit originates in Old English with god meaning good, and wit coming from wihte, meaning creature. And then it was foggy again. These look nice to me, rather ethereal. In this kind of foggy light, there is very little contrast, so I was exposing to the right to capture the maximum detail in the darker areas. This technique makes your photos look overexposed on the camera LCD playback display so it is often hard to see if you have made focusing errors. You just check to see if you clipped any of the brighter areas and keep shooting. Hard to see those playback displays outside anyway and I never bring my reading glasses out in the field. All the images are shot RAW and then in post-processing you make adjustments to bring the details out. That in itself is an amazing adventure. If you photo is overexposed (but without blown highlights) you can recover an enormous amount of detail from the RAW files. If the photo is underexposed, the sensor records less data so you are limited in what you can recover. It was hard to catch them with their bill, or head out of the water or mud. This one has a drop of water in its bill; I suspect they siphon up their food through that long bill. I know you don't see them eating anything; it isn't like herons that toss their prey into the air to position it for swallowing. 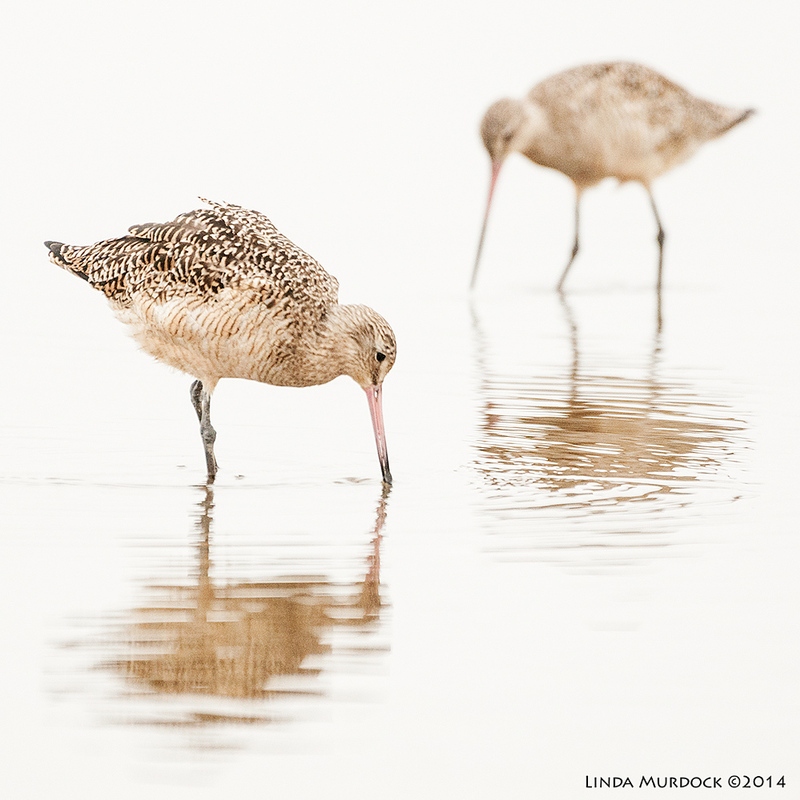 Remember we learned that the Snipes have flexible tips to their long bills to aid in finding prey and so do Godwits. Birds are highly specialized. This was a new bird for me. It is a Dunlin and this is the non-breeding plumage. Later in the year before they fly off to breed, they get a reddish-brown back and black belly. They are great fun to watch, the probing action has been likened to a sewing machine, and they have a fast and steady motion looking for food. The above map of migrations is from Wikipedia Commons. I just wanted to share the extreme distances this tiny shorebird covers. We were leaving the jetty, tired but excited about all the Godwits, when we noticed a Great Blue Heron was just standing on the shoreline. My first shot was at 12:06:34 even though he was slightly turned away from me, sometimes they turn toward you. You always hope. He quickly waded in the water and speared this giant fish at 12:07:06 and was flying away by 12:07:14. So. What's wrong with this photo? Shutter speed could have been faster (it was still set for the languid, probing shorebirds) and the danged bird is turned the wrong way! But you have to keep trying. Have you been to Bolivar yet? Don't you want to ride the ferry over and throw bread at the gulls? Were you bored with all that serious photography technique talk? Leave me a comment below. Click on that balloon-looking icon and sign in as a Guest with any name you choose. Mar 7 Curlew Confrontation or Courtship?